This book is simply fascinating–and true! John Leahr and Herb Heilbrun grew up in the same neighborhood, went to the same elementary school, were in the same third grade class, became WWII fighter pilots at the same time, and even flew in the some of the same combat missions, but they didn’t meet each other until they were in their 80s. John is black and Herb is white. In the 1930s and 1940s black people and white people rarely spoke to each other, let alone became friends. It wasn’t until a chance meeting when they were in their 80s–when Herb crashed a reunion for Tuskeegee Airmen to tell them how grateful he was for “saving his tail” during the war–that they ever knew the other one existed, let alone what strangely parallel lives they had led. These days, John and Herb are great friends, but it’s not hard to imagine that they might never have met. 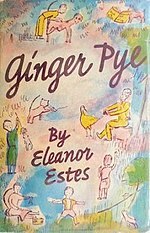 This book details their extraordinary experiences in the past, and their modern adventures telling children about them. Ever wonder what the biggest thing in the ocean is? Well, this Giant Squid thinks he knows. This book takes readers on a journey through the ocean where they get to meet various ocean animals that happen to be smaller than the squid. The friendly squid is even bigger than a shark. This brightly illustrated book uses fun characters to draw the reader in. Author Kevin Sherry doesn’t use many words to tell this squid’s story, but the words are carefully chosen and are as fun as the illustrations. Check out this book to find out if he really is the biggest thing in the ocean. I read a review of this book last year, and thought my daughter might like it since she was in a penguin craze. I must say, it did satisfy. The book is quite large. Luckily enough, the reader doesn’t necessarily have to count to 365. The book starts out with a family (mom, dad, older daughter, and younger son) receiving a penguin on January 1 with a note attached telling them to take care of it. Everyday a new penguin comes. The dad tries to figure out how best to “store” them: in dozens (12×12=144) or in a cube (6x6x6=216). Math is also involved by adding up days in a month or calculating how many pounds of fish the penguins eat, and then how much that costs. I really liked the colors used in the book—orange, black, blue, gray and white. My daughter really liked finding Chilly, the penguin with blue feet, amidst all the other penguins. The madness finally stops on New Year’s Eve when the uncle ecologist comes to explain and collect the 182 male and female penguins he has been sending throughout the year, leaving the family with Chilly. However, the next day, the cycle seems to begin again, but with a polar bear! A fun book to read about penguins and math; this is not a usual combination. Have you ever thought about what your life might be like if you lived in another area of the world? If you woke up one morning to find yourself in Paris, London or even Australia, there would probably not be much difference. However, if you were suddenly transplanted to the other side of the globe, to say, Pakistan, India, or Bangladesh, you might very well feel like Naimi, the main character in the book Rickshaw Girl–out of place and confused. In a country where a good education could make a real difference, Naimi’s family is too poor to send her to school. Naimi, whose family could afford only three years of school, now stays home to help her mother around the house. She dreams of being able to have a paying job to help her family with her income. However her only skill is drawing and a girl cannot earn a living by drawing—or can she? It’s a bumpy road that takes Naimi to the final conclusion of the story, a road with twists and turns that will surprise modern young American readers. But, Naimi is a spunky, if impetuous, girl and her conclusion is not only a surprise but a delight. A very special fox terrier puppy named Ginger Pye, who disappears on Thanksgiving Day, a colorful family in Cranbury, Connecticut in the 1920’s, mysterious footsteps and a stranger in a mustard yellow hat combine to make this 1952 Newberry Award Winning book still fun to read. This is a wonderful story. It seems to take place in the late 1800’s but it is a different world. In this world, huge, luxury airships ply the skies buoyed by a gas called hydrium. Matt Cruse is a cabin boy on the Aurora. He loves his airship and hopes to captain her himself one day. He is keeping watch one night when he sights a hot air balloon losing altitude. He is instrumental in rescuing the balloon and its occupant, a very sick man. While sitting beside the man in the infirmary, Matt tries to calm him by agreeing with him that he has also seen the beautiful winged creatures the man is talking about. The man dies but the next year a young lady passenger arrives on the Aurora in possession of the balloonist’s diary. The man was her grandfather and she has come on this trip in order to prove that he was not hallucinating ; that these creatures that he wrote about really exist. 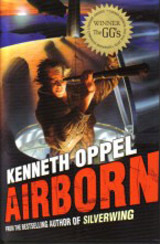 She enlists Matt’s help and then the unthinkable happens, the ship is attacked by air pirates and must make an emergency landing far from their route on an uncharted island. The island looks exactly like the drawing of the island in Kate’s grandfather’s journal. Their adventures are just beginning and the pirates do reappear. Kate and Matt turn out to be clever, brave, and intrepid. They do encounter one of the creatures which Kate thinks of as sweet but which turns out to be a very dangerous carnivore. I actually listened to this book. The book on CD is published by Full Cast Audio and it is a very good listen. The characters are well done and the music adds a lot to the feeling of being airborn. If 355 pages is a daunting number but the books sound good, try listening to it. You’ll love it! This is a great read or listen for boys or girls grades 6-8 if they like adventure, smart kids and animal or pirate stories. In this Sheherazade type tale, Bob, a mouse, keeps telling stories to Muffin and Brutus, cats, so he will not be eaten. The stories all feature a mouse as a main character in one of the better known fairy tales from Cinderella to Jake and the Beanstalk. They are fun because there is always a little twist to them, like Cinderella turning into a horse and Bob turning into the girl in a fancy outfit. They will make you laugh out loud with some of the turns the stories take. But the big questions is: Are Bob’s storytelling skills enough to outwit the two cats? You will grow to love not only Bob, the storytelling mouse, but the two hungry cats as well. This was a cute, quick book. For kids who like fairy tales and animal stories, it is a sure fire hit.